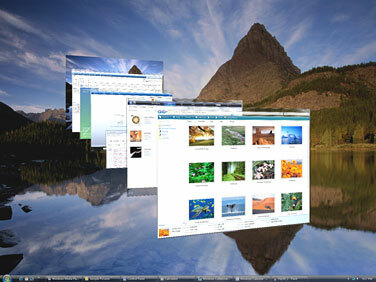 One of the new feature or enhancement in Windows Vista is Windows Flip and Windows Flip 3D windows management system. You should be familiar with using Alt + Tab keys in Windows XP, Windows 2000/2003, Windows Me/98/95 and even earliest version of Windows 3.x to manage or switch windows, programs or tasks. The “cool switch” task switching functionality, as referred internally by Microsoft, is an easy keyboard shortcut way for Windows users to switch or move between various programs or tasks windows when multitasking. However, the Alt+Tab tasks switching function is limited and not user friendly in previous version of Windows. Microsoft tries to enhance the feature with Windows XP PowerToy called Task Switcher where a new switcher pane with thumbnails of each running application will be shown when Alt+Tab is pressed. This concept is now further enhanced and renamed to Windows Flip and Windows Flip 3D in Windows Vista. Windows Flip and Windows Flip 3D allows Windows Vista users to flip through open windows by using Alt+Tab keyboard shortcut. While you press Alt+Tab and hold down the Alt key, Windows Flip provides a live thumbnail of each window, together with the name of the current document, if applicable, followed by the application name running in the highlighted window, rather than just a generic icon and file name as in previous version of Windows, so that users can quickly and easily identify the window that they want to switch or flip to, particularly when multiple windows of the same kind are open. In you’re pressing Alt + Tab quickly, Windows Vista will jump you to previously accessed and viewed Windows without going through Windows Flip thumbnails view. Another more advanced task switcher on Windows Vista is Windows Flip 3D, which may eventually replace Windows Flip. With Windows Flip 3D, instead of just a live static thumbnail of each applications, the thumbnails of each windows are now “live” where any changes to each window will be reflecting immediately on the thumbnail preview (i.e. when playing movie, you will actually see the movie in Flip 3D window preview). In order to use Flip 3D, you press Windows + Tab keys instead of Alt + Tab (Windows key normally located conveniently beside Alt key). The preview windows in Flip 3D is much larger than the live thumbnails of Flip, and open windows are angled in a stack in Flip 3D where users can use the scroll wheel on your mouse to flip or navigate through them to quickly locate and select the application or task they want to work with. Beside mouse’s scroll wheel, you can also use the Left Arrow and Right Arrow keys to move through the stack of windows. If you’re using mouse’s scroll wheel or arrow keys to navigate in Flip 3D, Windows key must be kept pressed down. Once released, Windows will exit from Flip 3D and the window that is visually on top of the others in the window stack will be selected and displayed, or you can select the screen you want with mouse. Navigating open windows in Windows Vista with Flip 3D with scroll wheel, arrow keys or Windows+Tab keys. Both Windows Flip and Windows Flip 3D requires Windows Aero Glass feature enabled to work (which mean your hardware specification has to match the requirement of Windows Vista Premium Ready PC). Windows Flip is not available in Windows Vista Starter edition, where it still looks like the classic task switcher in Windows XP with no thumbnails of windows. Flip 3D feature is only available in Windows Vista Home Premium, Windows Vista Business, and Windows Vista Ultimate. In Windows Vista, Windows Desktop is also been shown as one of the running tasks where you can select in order to jump directly to desktop. In Windows XP, this feature is only available with “Show Desktop” command icon. You can now test drive and has a feel on how Windows Flip 3D works and behaves in Windows Vista windows navigation system at showusyourwow.msn.com (no longer available), although the “windows” are actually photos instead of tasks. The same website also runs “Wow” contest that giveaway free trip and free Windows Vista.